The flowers are large, big red ball shaped, and this is a reasonably compact growing cultivar. An excellent plant for the border where the red flowers will give a shaded area in the garden a real lift. Long flowering, from early summer through to autumn, and yes you can cut the flowers for indoors, Hydrangea ‘Kirsten’ is a real stunner. Hydrangeas are generally tough plants and require little care and Hydrangea macrophylla Kirsten is no exception. A humus rich moist but well drained soil is best, and although this cultivar copes with more sun than some, protection from hot sun is essential. 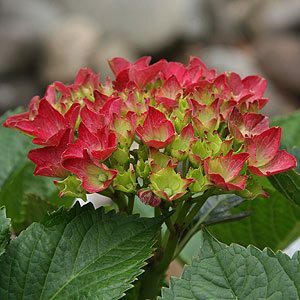 Red hydrangeas generally require an alkaline soil to maintain colour, flower buds develop on last years wood, pruning in not essential other than pruning once a year to keep in shape. Will reach around 1.5m in height depending on conditions.